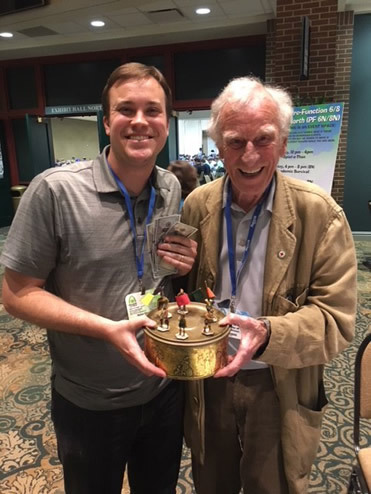 Geekway 2018, held in St Louis, was the occasion for the second Bin’Fa tournament, won last year by David Thompson who returned hoping to reprise his success. But the winner this year was Dylan Crawford, who had learned the game only the day before. Congratulations, Dylan! Hope to see you next year. The tournament made history for another reason. Scott Probst, a Bin-Fa enthusiastic of long standing, was competing in an earlier round. The game reached the stage where each player was reduced to four army units, making a knockout blow from either player an impossibility. The two players spent their turns going for supplies. If supplies ran out, a player would toss in a single supply, move, then end the turn. Both acknowledged that they were waiting for the other player to give up, remembering that $500 awaited the winner. What to do? I resolved the issue by proposing that each player receive two additional army units. They agreed and the game concluded quickly when Scott’s foray into the vortex ended in disaster. I soon reflected that the stalemate problem was not a problem at all; it was the solution to a problem that I hadn’t known existed. Bin’Fa represents many aspects of warfare: the cavalry charge, airborne troops (the vortex), the supply train, friendly fire, terrain, the general, and most recently, the weather. But the notion that a player would go after supplies, turn after turn, with no other end in view, suggested something in need of a fix. In real warfare, except for rare instances such as Nazi Germany’s defeat, the battle does not go on until every last units of the opposition are annihilated. The losing side makes an assessment, then sues for peace if victory is clearly beyond reach. The Bin-Fa solution is to start charging for supplies. Opponents agree beforehand what the tariff will be. A nickel? A quarter? A dollar? Each player keeps an account of supplies received (calculator provided). When you recognize that victory is out of reach, it makes sense to cut your losses, concede defeat, and pay your opponent a sum equal to the number of supplies received. That’s for the loser. The winner has the opportunity to compete as all around Bin-Fa champion. Whenever two players conclude a game in which the supply numbers were recorded, the winning player posts the result on our website. If you won using fewer supplies than the current champion, you post the result and occupy the top spot. How low can you go? Only time will tell. How will you recognize a fellow player who’s into high (or low) stakes Bin-Fa? We offer a T-shirt. The back shows the Bin’Fa logo; the front bears a quote from the movie Casablanca: “I’m shocked, shocked, to know that gambling is going on here.” Each one comes with its own pocket calculator. Order yours now at info@bin-fa.com. That includes Board Game Makeover: We are so excited to share this review of Bin'Fa - made over into a space game, by reviewer Mike Parkinson for "Board Game Makeover" Check it out to see how you can totally jazz up your Bin'Fa Game! Click here to see the KickTraq success and progress meter! 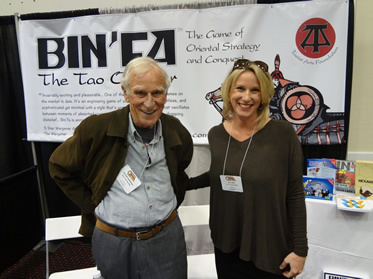 Ken Hodkinson has announced a new edition of the strategy war game Bin'Fa--The Tao of War, with plans to launch the game in March at the GAMA trade show (see "2015 GAMA Trade Show"). The game will be funded by a Kickstarter campaign in November. The game was initially developed by Hodkinson in the late 1970s, based on Sun Tzu’s Art of War. 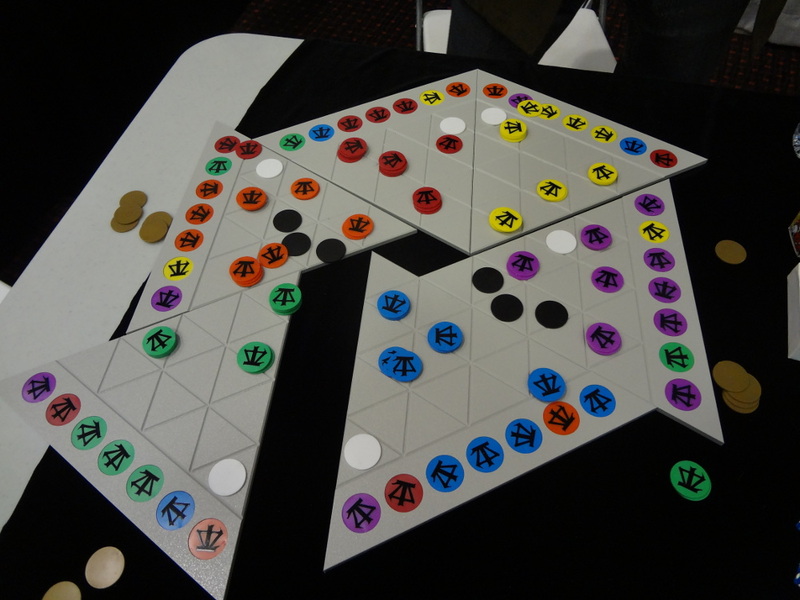 Avalon Hill published a version of the game, Hexagony, with development changes by Alan Moon. The game never caught on, and Avalon Hill relinquished the copyright in 1986. Hodkinson has continued to develop the game since then, releasing various versions over the years, including the Seacoast Tube Edition in 2000. Players take the role of army generals in ancient China, out to capture and eliminate enemy forces. Generals must keep supply lines open to each of their army units, because if a unit is cut off on all sides by the enemy, they are forced to surrender. The new edition includes the addition of the General, Vortexes that allow player to move across the board in one move, and rule changes that govern the gathering of supplies. The redesign also allows the separation of the triangle board pieces from their original hexagon shape, so that the modular pieces can be combined in various ways, altering the terrain for each new game. Another presenter was brimming with both character and personality. Kenneth Hodkinson is the creator of Bin’fa, the Tao of War, which began in 1971, when he was working in a Massachusetts factory on a Davenport machine. He got to thinking and devised a strategy game with furious cavalry charges, promising that once a Bin’Fa game begins, “soon there’s blood on the floor.” Hodkinson got some friends to invest and had 500 copies of the game produced, submitting one to Avalon Hill after the creator of Mastermind, Roddy Sampson, said he loved the game. While it was initially rejected, Avalon Hill later picked the game up, releasing it as Hexagony, so-called because of the hexagonal nature of the playing board, and perhaps for the agonizing deliberation that confronts the game’s generals during gameplay. Hodkinson provided an even richer, and more in-depth history of what would become Bin’fa, the Tao of War via a five-page handout passed out to the attending press. Fast forwarding to the present, the game is now played on six board tiles that can be arranged and re-arranged into a near-endless series of combinations. No game need ever be the same. Bin’fa has the look and feel of a classic abstract strategy game like Chess or Go, but also includes mechanics for supplies/logistics, terrain, and a general. In another modern twist, Bin’fa can also be played with vortex markers, allowing an army unit to teleport across the battlefield, further adding to its complexity. Click here to sign up for updates on Bin'Fa! Find us on Facebook! Be a Fan and share with your friends! Copyright 2009-2011 Allsaid & Dunn, LLC. All Rights Reserved. All profits of Bin’Fa go to promote Taoism.